This flirty, romantic dress is perfect for date night with someone special and comes in two great colors! The Romantic Night In Paris Dress features a sweetheart neckline, lace overlay at the bust, and a flowy pleated chiffon skirt. 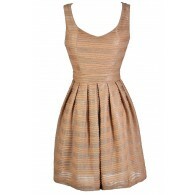 This dress is fully lined and has a lined and lightly padded bust for support. An invisible back zipper makes this dress easy to get into. An attached black ribbon sash wraps around the front and ties into a bow completing this great look! This dress is perfect for a night out, and would look great paired with black pumps and a clutch. Also available in Pale Pink. 60% silk, 40% polyester. Hand wash, cold water separately. No bleach. Hang to dry. Small measurements: length from top of bust to hemline 28”, bust 29-30”. You have added Romantic Night In Paris Dress In Ivory into Wishlist. You have added Romantic Night In Paris Dress In Ivory for Stock Notification. You have set Romantic Night In Paris Dress In Ivory as a loved product. You have removed Romantic Night In Paris Dress In Ivory as a loved product.